Energy use in buildings accounts for around 50% of the CO2 emissions in the UK, with poor airtightness responsible for up to 40% of their heat loss. A good standard of airtightness is therefore an important component in achieving fabric energy efficiency. The benefit of improved insulation levels and energy efficient heating systems is largely lost if warm air is able to leak out of a building whilst cold air leaks in. A mandatory requirement for airtightness has been set by the Building Regulations and Scottish Building Standards to ensure that reasonable levels are being achieved. These make sure that it is compulsory to subject non-domestic buildings and samples of newly-built dwellings to a pressure test in order to measure and confirm their airtightness upon completion. 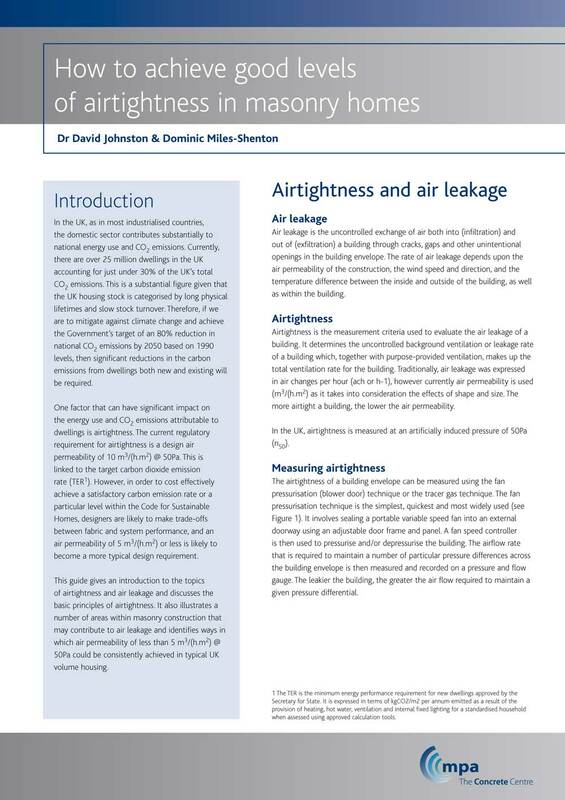 ‘Airtightness’ refers to the measurement criteria used to assess the uncontrolled air leakage in buildings i.e. through gaps, cracks and other unintentional openings (see Figure 1). Since the 2006 edition of Part L1A and L2A of the Building Regulations (2010 in Scotland) a limit has been set for the maximum acceptable level of air leakage in new buildings, which remains the same today at 10m3/(h.m2) at 50Pa (in Scotland, it is 7m3/(h.m2) at 50Pa). To demonstrate compliance requires specialist pressure testing of the building. The test uses a fan, to pressurise the building to a constant 50 Pa, during which the air change rate in the building is measured. This must not exceed 10m3 per hour for every square metre of floor space. If the test produces a lower value than this the building is more airtight.